I found David Clarke's new book entertaining, but he and I disagree about its significance. I see his book just catering to the UFO theatre aspects of the UFO controversy, rather than being a serious look at the real UFO reality. David Clarke clearly sees his book as contributing substantially to the full story of the UFO mystery. In other words in David's view "UFOs R Us" Real UFOs are not physically real. Its all misidentification, hoaxing, stories etc - the rich fodder of social scientists, psychologists, and folklorists - a perfect fit for the psychosocial hypothesis (PSH). As I read David Clarke's book I was waiting for him to deal with the kind of UFO events and cases I have encountered in more than 40 years of UFO study, namely physical evidence cases. Instead we get a very light touch indeed and a dismissal that all such cases are not what they seem. There is no physical evidence for UFOs, according to David Clarke. David Clarke’s new book is well worth reading as it gives an excellent description of the “psychosocial” perspective. While there may well be unexplainable cases he clearly feels that they are not evidence for extraterrestrials visiting Earth. The answer to the mystery is of human origin (both psychological and social explanations), with diverse causes. Mankind created the UFO myth, in part to address the need to know we are not alone in the vast universe. The UFO myth is belief driven and evolving. No hard evidence is available to support the extraterrestrial hypothesis (ETH). The book is presented as his personal journey through ufology, but it seems clear that it is a cleverly framed exposition of the psychosocial hypothesis (PSH), with a personal perspective inserted in each chapter. He describes wanting to believe himself, but maturity and experience turned him to embrace the PSH – a comfortable fit for a researcher trained in folklore. Here are parts of David Clarke’s journey through “the UFO myth” as described in his book. He connects with early ufology in Britain through an interview with Dennis Plunkett of the British Flying Saucer Bureau. The British press announced the end of ufology when it was claimed the Bureau was closing in 2001. Plunkett disputes the facts and tried to correct the error. “Ufology” had moved on. David Clarke uses Allen Hendry’s excellent book from 1980 “The UFO Handbook” to argue that the UFO mystery is all about UFOs being reduced to IFOs, namely identified UFOs. Pelicans and Venus are big starters here. 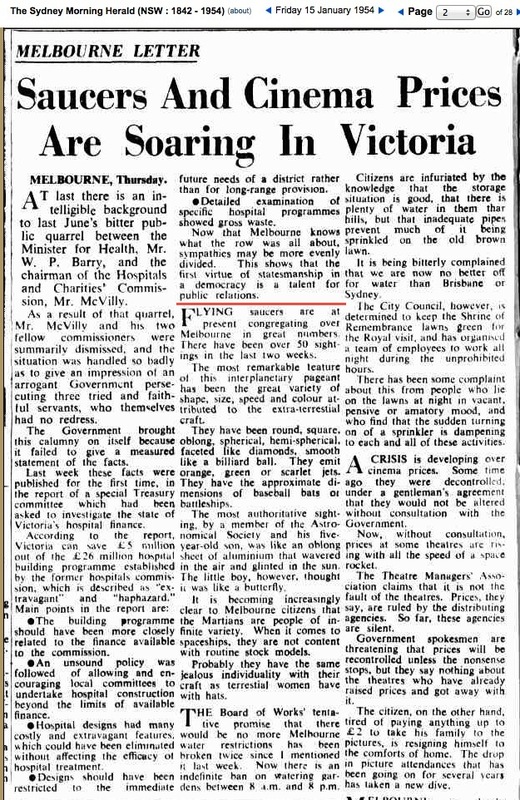 Pelicans carry the “badge of honour” for the PSH school, despite the fact that as an explanation for the Kenneth Arnold sighting back in 1947 it is far from proven. We don’t learn from David Clarke’s coverage that there did appear to be a ground based witness FredJohnson, a prospector, in the same area at about the same time, who saw a number of disks, and even reported some possible compass effects, during the passage of several of the objects. Clearly magnetised pelicans with a powerful magnetic field! But the USAF listed the case as “unexplained”? David Clarke states (pg. 70) “The misperceptions of pelicans and Venus that explain many UFO reports happen unexpectedly and without warning. Scientists do not know when they are going to occur so cannot observe and analyse them under controlled conditions.” Pelican behaviour and migrations and flight are pretty well understood. Their localities are generally known with some precision. Ask any bird watcher with a passion for pelicans. Venus – ask any astronomer or consult sky charts, Venus’ position, movements, appearance are well understood. Again plenty of opportunity for controlled observations and studies. The reality seems that the pelican/Venus explanatory nexus is vastly overstated as an explanation in compelling UFO cases. The behaviour and characteristics are well known and a bit of thinking usually sorts those sorts of cases out. Warminster and the fake UFO photos associated with it (particularly David Simpson’s SIUFOP experiments) are used as a general template to reinforce the idea of the “will to believe” by uncritical witnesses or believers. The propensity of hoaxing the gullible is put forward extrapolating very broadly that "...every type of UFO evidence, from complex photographs to alien abductions, secret government documents and stories told by high ranking military officials about extra-terrestrial cadavers hidden in air force hangers, has at some point been unveiled as being invented. " (p.93.) This is really evidence of over reaching, as he falls far short on evidence for that statement. Perhaps he is arguing if you can prove one, it is reasonable to argue that all of this type of claimed evidence should be treated the same and therefore there is no need to bother with any other evidence. David Clarke is on surer ground when he uses his impressive work on helping bring official British government UFO files out into the open. There is a lot of interesting material particularly in his interview with psychologist Alex Cassie who was involved in the MODs investigation of Angus Brooks’ intriguing but strange “craft” sighting in 1967. The invoking of a “lucid dream” initiated by a “floater” in the eye seems a stretch, particularly given the long duration of the claimed event. Cassie’s team investigation was a particular standout because it was detailed. The majority of MOD investigations were far less impressive and could be easily called limited at best. I saw the same pattern in Royal Australian Air Force (RAAF) investigations - some standouts, but hardly representative of the true picture. Most investigations were inadequate. In fairness many cases really didn’t call for detailed investigations, but when impressive cases didn’t get much attention nor anything approaching a serious and adequate investigation, it is difficult to give much credit to official investigations as sources of “gold standard” conclusions. David’s conclusions about the so-called Condign report are not that far from my own. It had poor foundations in terms of poor case data (large amounts of MOD data with very limited information & little investigation) meant it couldn’t be relied upon as a basis for viable analysis. It did serve a purpose as the basis of disengagement for the MOD from UFO “investigations.” It was interesting to see that David Clarke had clearly established who “Mr. Condign” was and that he had witnessed a UAP (unidentified aerial phenomena) during a secret mission. While it may have made the man a good fit for compiling the report, it didn’t validate the report as credible. I’m sure UFO Truth editor Gary Heseltine will address his interview that is mentioned in David Clarke’s book, but I was struck by the proclamation made in the same chapter that, “for all its talk about evidence, ufology was not an empirical discipline. In order for it to survive it had to close itself off from the scientific method." (p.145) With my science background and as someone who researches UFOs I take issue with that statement. Sure there are many “UFO researchers” who fail the basic critical thinking test, a basic template for a scientific investigation, but there are many more that apply reasonable scientific methodology. There are many aspects of reported UFO activity that thrive on the application of scientific method in the pursuit of evidence. For example instrumented field studies of UFO “flap” areas – that is, potentially utilise “repeatable phenomena” – a mainstay of scientific method. 1. "There is no such things as 'the UFO phenomenon' but there are lots of phenomena that cause UFOs." Richard Hall, author of the 1964 “UFO Evidence” undertaken for NICAP, and the 2000 “UFO Evidence” follow up (“A thirty-year report”) provides impressive evidence of repeatable patterns amongst a wide selection of UFO data. Basic pattern replications in 2 separate studies more than 30 years apart, argues powerfully for a phenomenon of some validity. In other words a real “UFO phenomenon.” IFOs help calibrate our methodologies and interpretations of the data. Force fitting of ill-fitting “explanations” or ignoring “inconvenient data” in order to make explanations fit in compelling cases happens repeatedly within the ranks of PSH thinking. The Battelle “Stork” study back in the 1950s isolated “unknowns” by virtue of their lack of correlation with IFOs, which led to some limited UFO modelling of types. That didn’t stop the USAF misrepresenting the data. 2. "There is no such thing as a 'true UFO.'" 3. "Extraordinary claims require extraordinary evidence." Extraordinary investigations are also required. “Operation Prato” in Brazil is an intriguing example. The Bigelow funded “Skinwalker Ranch” might be but without more detailed access to data certainty is not there. The CAIPAN 2014 Workshop highlights the kind of thing that can potentially be done. Philippe Ailleris “The lure of local SETI:Fifty years of field studies” (2011, and its follow ups) provide a good template for further study. Without these sorts of investigations being the “norm” rather than limited exceptions, “extraordinary evidence” is going to be limited and uncertain. Lots of worthwhile databases and studies of case types like physical traces, “EM-car stop” cases etc argue for compelling trends and data. 4. "Accounts of UFO experiences form the core of the syndrome, but stories do not constitute 'evidence.' They are folklore." Again the 1968 Minot case is good example. David Clarke writes, “Pilots are experts at identifying aircraft but their pilot skills are no better than anyone else’s when it comes to unexpected close encounters with stray balloons or flocks of pelicans.” This is ridiculous, however David Clarke doesn’t cite anything credible, such as a lot of compelling cases in the NARCAP database. I’ve interviewed pilots who have reported engine power loss in the presence of nearby UFOs, hardly the stuff of stray balloons and pelicans. 5. "Culture - not experience - creates the UFO interpretation but some experiences are independent of culture." Provided we can limit our embrace with “the UFO theatre” that David Clarke is preoccupied with, the “endless feedback loops” that are encountered in more compelling case studies, that seem scarce in this book, would mean one would encounter loops of appropriate levels of investigation, research and analysis. There is already a lot of that material, but “the UFO theatre” preoccupations of PSH promoters instead see loops of anecdotes, poor enquiries and folklore – the consequences of a skewed focus. 6. "The UFO syndrome fulfils the role of the supernatural 'other.'" The argument that this “fulfils a deep emotional need” is a “cop out.” It could be argued that its nothing new. The technological ETH model could be viewed as a western imperative. “Sky being” lore is very widespread in ancient and native cultures. So it could be argued the ETH’s growth and diffusion around the world is not a triumph of western imperialism, but rather a shift (or technological upgrade) of existing beliefs in worldwide indigenous cultures. A “modern myth”- perhaps not. It could be just as easily argued for a complete inversion of that perspective. The modern US rendering of the “UFO myth” is just an inevitable technological reframing of an existing worldwide “myth” system with very deep roots. Perhaps a reframing might have western culture catching up, belatedly reframing an existing long held belief system. 7. "The extra-terrestrial hypothesis and other exotic theories cannot explain UFOs." The ETH in its simplest form suggests that a technologically advanced based phenomenon is visiting Earth. What is disprovable (and hence potentially scientific)? Well the hypothesis that there is no advanced technology is evident in UFO reports? Science and sceptics have been arguing that for years (e.g. The flawed Condon report) – that there is no evidence for advanced technology. In fact the contrary view may very well be provable . There are lots of potential discoveries and useful insights in UFO data, none of which can be found in David Clarke’s book. Dr. Myrabo’s seems to modify his “light craft” technology ideas (NASA related) in response to viewing and examining evidence in a UFO event filmed by Ray Stanford (see Chris Lambright’s “X-Descending”); try reading Paul Hill’s “Unconventional Flying Objects – a scientific analysis” which is based in part on his own sighting and examining a lot of UFO data in his capacity as an unofficial UFO “clearing house” at NASA; Auguste Meesen’s 3 papers in the 2012 PIERS electromagnetics Research Symposium – each using UFO data to support various arguments & hypotheses related to propulsion and effects; Claude Poher’s analysis of evidence for possible advanced propulsion in the UFOs imaged in the radar photos from the 1968 Minot B52 incident. 8. "The idea of a super-conspiracy to hide the truth about UFOs is unfalsifiable." 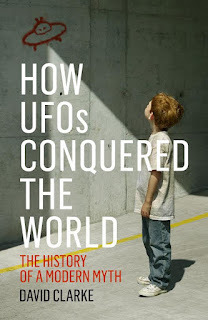 I suggest that instead of concentrating on the unproductive study of the collision of “UFO theatre” with conspiracy belief, why not focus on what governments have really done. For example read “UFOs and Government” by the UFO History Group. 9. "The common denominator in UFO stories is the human beings who see and believe in them." Why not study the data that has emerged and is emerging from instrumented studies, physical evidence, forensic evidence (even in stranger areas like alien abduction claims. For example see my book “Hair of the Alien”). Once again the 1968 B52 radar visual case with photographic evidence from the radar screens is a good place to start. The evidence already strongly suggests that UFOs are more than just a human creation. 10. "People want to believe in UFOs." One of the mantras that comes out frequently in David Clarke's book is the argument that Kenneth Arnold's watershed sighting of "flying saucers" in 1947 did not involve "saucers" and given that people went on to report "saucers" everywhere, then that re-enforces that people just reported "saucers" because they were influenced by the "flying saucer craze." Well, one thing researchers are surely aware of (well maybe PSH advocates are an exception, when it suits them), is that UFOs (or UAPs) come in all shapes and sizes. While "saucers" are popular, people were reporting a variety of things, not just "saucers". “The most remarkable feature of this interplanetary pageant has been the great variety of shape, size, speed and colour attributed to the extra-terrestrial craft. “They have been round, square, oblong, spherical, hemi-spherical, faceted like diamonds, smooth like a billiard ball. They emit orange, green or scarlet jets. They have the approximate dimensions of baseball bats or battleships." 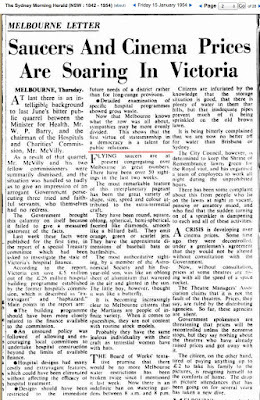 "It is becoming increasingly clear to Melbourne citizens that the Martians are people of infinite variety. When it comes to spaceships, they are not content with routine stock models.